Fleming’s Prime Steakhouse & Wine Bar: À la Carte? No…Bar la Carte! Hello Tampa Bay foodies! Erica here to share some tasty news. Fleming’s Prime Steakhouse & Wine Bar has FINALLY revealed their new Bar la Carte menu! Salt and Pepper Shrimp: served with crispy fried green beans, thin slices of lemon, and a caper-mustard dipping sauce. 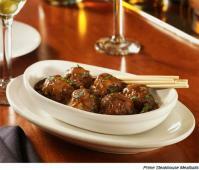 Prime Steakhouse Meatballs: tossed in a spicy peppercorn sauce with shitake mushrooms. Fleming’s Original Prime Rib Melt: slow roasted prime rib stacked on a toasted parmesan baguette with Swiss cheese, sautéed mushrooms, whole-grain mustard, horseradish and au jus for dipping. Filet Mignon Flatbread: topped with Danish Blue and Monterey jack cheeses and red onion confit. Cedar-Roasted Mushroom & Artichoke Flatbread: Monterey Jack cheese, roasted Christopher Ranch garlic and roasted red peppers. Fleming’s Housemade Burrata: served with charred cherry tomatoes, fresh wild arugula and toasted garlic crostinis. As if the menu could not be any more freshly flawless, the world-class Prime Burger, borrowed from the happy hour menu, was included too! It is a Fleming’s favorite and could not be left out. Each made-to-order creation perfectly complements a brand new cocktail menu. Whether it’s a Vintage Vodka Martini or a crisp Pinot Grigio blend, there is no wrong choice. Next time you’re in Fleming’s make sure you ask about the Bar la Carte menu. Your taste buds will not regret it. For more flavorsome food suggestions, check out visittampabay.com/visitors/restaurants. Bon Appetite! That&apos;s it for now, but be sure to check back for more delectable Tampa Bay dining updates!